Today’s CrossFit WOD included 15ft. rope climbs. In our garage gym, we do have a rope, but it’s a bit slippery and we only have just over 9 feet clearance. Besides all that, I’ve never done a real rope climb. When we did Tough Mudder last year, we had to climb ropes, but the ropes had knots tied in them, and a fellow Mudder held the rope taut for me so it was easier for me to climb up. 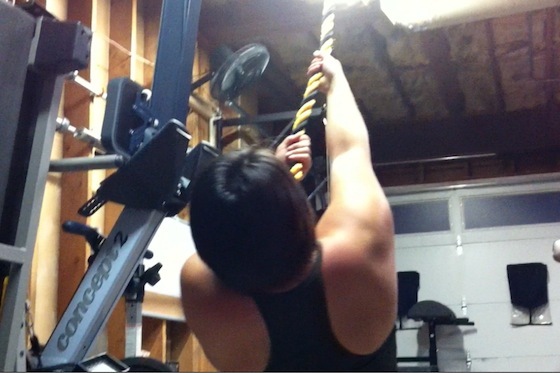 But like I said, I’ve never actually done a “real” [CrossFit standard] rope climb. Today, I was able to do a modification of a rope climb so I could do the WOD and work on my rope skills (or familiarity at least). To do this modified rope climb, I started out by lying down on the floor, and used just my grip and arms to “climb” myself up to a standing position, then reversed my way back down. This is a good modification for progressing into rope climbs – for those who are uncomfortable and/or aren’t yet strong or familiar enough with the rope to climb it by themselves. It’s pretty fun, too. 3, 2, 1 … GO!